Last week, I had a conversation with a wife who said she was experiencing one of the worse seasons of her marriage. Her husband lost his job, their finances are, tight and she is doing without many of the luxuries that she has always had. She also mentioned that, there have been some family and friends who have encouraged her to leave her husband. In spite of what people are saying, she is encouraged to keep her vows and stay with her husband for better or for worse. First of all, when we are dreaming of getting married and planning that beautiful wedding, we often think about things getting better, but not things getting worse. Our society focuses on staying in a marriage as long as things are better. When the worse comes, we see very few people staying. As a matter of fact, many separate and divorce as soon as the first challenge comes their way. The word better is defined in many different ways. Better means of superior suitability, advisability, desirability acceptableness, larger, greater, improved, in a more appropriate, acceptable way or manner. To be better off means that we are in more fortunate and happier circumstances. Worse is defined as bad, evil, wicked, unfavorable, in less good condition, a disadvantageous manner or not good in any manner or degree. A real marriage has some good (better) days and some bad (worse) days. With the help of Almighty God, you can make it through the good and the bad. I am a witness! God created marriage to be a covenant relationship. In Malachi 2:14 a wife is described as a companion and also as a wife by covenant. This means that God intends for us to have a permanent partnership with our husband/wife. 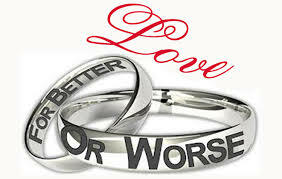 If you are married, be encouraged to be committed for better or for worse. If you are planning to get married, be sure that you are willing to be permanently committed. With God, ALL things are possible! The phrase for better or worse is said as a convent but also many of us take it likely because in our minds we think we know what worse is. When I witness what I thought was worse I was ready to run however the good thing about the worse is that it help me grow as a wife and daughter to GOD.